1. Do your best to keep work and home life separate. This means when you leave the job physically, your mind does, too. Before you walk in your front door, you put away your phone and laptop and leave them aside until the morning or at least until the kids are asleep. 2. You also do your best to keep problems at home out of the work place. Texting kids and calling teachers needs to be set aside during your work hours. Save that communication for lunch time. I know you need that lunch break, but if you’re worried about your child, it won’t be much of a break anyway, so use that hour (hopefully an hour) to email the teacher, call the guidance counselor, and check in with your child’s psychotherapist. Then set all that aside and resume work with a clear conscience and hopefully some good advice. 3. When you’re at home attend fully to your troubled child. Listen carefully to what’s on your son or daughter’s mind The Parental Intelligence Way. 4. 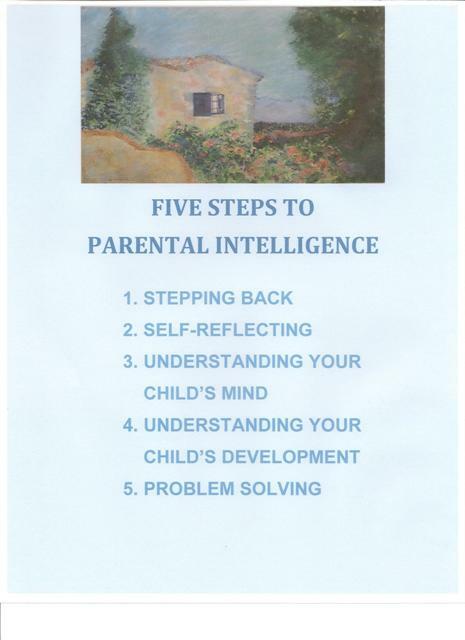 The Parental Intelligence Way means stepping back at puzzling behavior and looking for patterns. Then self-reflecting on your feelings about the behavior which may give you insight on how you react to your child’s behavior. Remember their stage of development and inquire nonjudgmentally about what’s troubling them. Don’t interrupt until the child is finished talking and even then ask for more information before giving your advice. Ask your child if they’d like your vantage point to lend to their perspective. If they just want a sounding board, refrain from advice and just be a solid support. 5. Now that you’ve given your child your sincere support, understood his or her dilemmas, spoken to school staff as needed and sought therapy help if warranted, you can go to work with a clear conscience. Now you can concentrate on the tasks before you productively. relieving your anxiety. You’re no longer feeling helpless and have a direction to proceed with each day. You are proactive, not passive on your own and your child’s behalf. Your work attitude and concentration will improve because your anxiety is lessened. Of course this plan is hard to follow because it’s hard to turn your mind off from your worries when at work. But if you can put work and home in separate compartments, so to speak, in your mind and remember that you are attending to both fully, you will find your anxiety is reduced considerably. You will find that as you discover your work has improved and your child and you are communicating well, the anxiety spiral declines and you can give yourself credit with lots of positive affirmations for being a working mother or father. Your relationships will also improve as you bond more fully with your child and show a more relaxed and confident attitude at work.